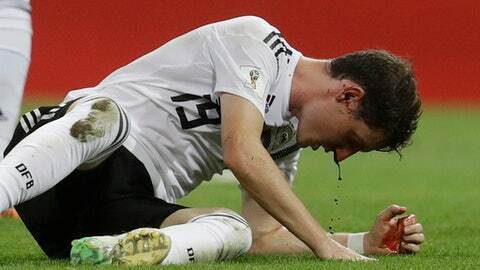 KAZAN, Russia (AP) Germany midfielder Sebastian Rudy has been ruled out of the team’s final group game against South Korea at the World Cup after suffering multiple fractures to his nose. Coach Joachim Loew said Tuesday on the eve of the match that Rudy hadn’t recovered after undergoing surgery. Rudy picked up the injury during his team’s 2-1 win over Sweden last week. He was forced to leave the pitch after a Swedish player’s boot slammed into his nose in the first half as he was on the ground. Loew said it wouldn’t make sense to make Rudy play with a protective mask. ”It’s two or three days too early,” he said. The German coach will also be without defender Jerome Boateng, who is suspended after getting sent off against Sweden. ”All other players are available,” Loew said. Germany is guaranteed to qualify for the last 16 if it wins by at least two goals.